This week, Brunswick Forest celebrated the opening of the community’s new pickleball courts with a celebration featuring all-level, round robin play, a cookout on the patio at Cape Fear National and a toast to the new courts with beer and wine specials. 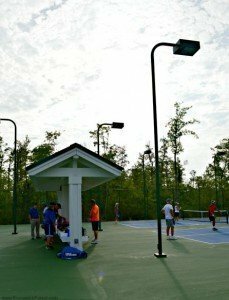 Pickleball continues to be one of the most popular activities among Brunswick Forest residents and the new courts are already getting plenty of use by members of the Brunswick Forest Pickleball Club. The Brunswick Forest Pickleball Club began in late 2013 with about 80 members. 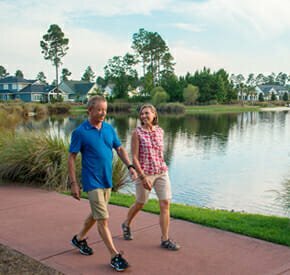 Prior to this, interest in the sport had grown after it was introduced to residents by the developers of community, who learned about the game during a visit to Florida. Today, the club has more than 300 members and growing. “Only a few people knew about it a few years ago,” says Brunswick Forest resident and Pickleball Club President Jim Gautier. “Now, it seems like everyone is playing it.” Jim and fellow resident, Marty Smith, who is the Brunswick County Ambassador for the USA Pickleball Association (USAPA,) teach the game to other residents in the Leland area and in Wilmington. 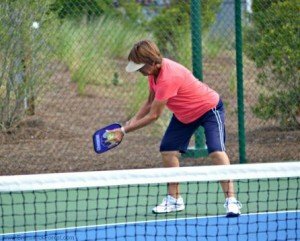 Because of their efforts in spreading the love of the game, interest in pickleball is growing in the Cape Fear region. Besides organizing matches within the community and teaching the game to residents of other areas, members of the Brunswick Forest Pickleball Club participate in training clinics to help new members master the game. These clinics take place monthly and are taught by a core group of players with the intention of building skills. There are clinics for both intermediate and beginning players. One does not need to be an expert to play, insists Marty and Jim. All that is needed is a willingness to learn and an enthusiasm for having fun. Every Saturday, the club members play by division: A, B, or C, with A being the most elite players and C, the beginners. They use a ladder system to organize matches with rotating partners. The Brunswick Forest Pickleball Club has just launched a new Pickleball League with 12 teams and 48 players. The league’s games take place on Tuesday evenings and teams compete against one another for the league championship. Want to learn how to play pickleball or join the club? 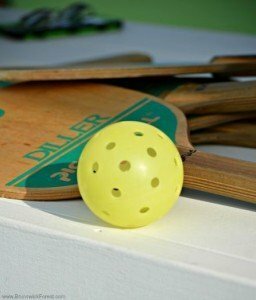 Stop by the pickleball courts any Saturday and someone will be glad to show you how the game works, or visit the Brunswick Forest Pickleball Club website to register for membership.